It's time that I share my "golden tools of beauty". I have been using these products for quite a long while now and I think I have gauged enough perspective to really be able to recommend these beauty products properly. Note: I will only mention the products that passed my expectations... repeatedly. You've heard me talk about L'or before. Here I am mentioning the product again because I have developed such deep love for this product already through the months that it helped me shimmer through my stressed days. 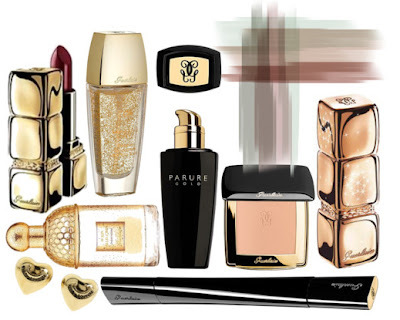 Together with L'or, I would have to give my definite thumbs up to Guerlain Parure Liquid Foundation which to me is more than an ordinary foundation. Whenever I use Parure, I cans kip concealer altogether! When used after L'or, I look tres chic! Similar to it's liquid counterpart, Gold Parure is also available in powder format. The packaging for this compact is divine because the sponge is separated from the actual cosmetic reducing bacteria growth thus extending your powder's life span. Those who are hygienic will definitely favor Guerlain's compact foundation. Few weeks ago, my mom and I were at Rustans Makati enjoying the numerous beauty counters available, she at the perfumeries while I hopscotch through every luxurious brand Rustans carry. Rustans to me is my candy store, really. Maybe when Sephora finally lands in the Philippines, that would change, but while it hasn't, Rustans will always leave me psyched and excited over everything beautiful from clothes, accessories, shoes and of course, make-up. Anyway, other than the foundation, I would want to really highlight Guerlain's double wand Mascara. Many of you know by now how much I fancy lashes and before I retire my Guerlain Mascara let me give it one last momentous glance because to those of you who also share my love for thick and long lashes, Guerlain's line won't disappoint and is trust me, worth every penny spent. I've been using it for almost four months now, not consistently since I rotate my cosmetics to ensure I get to really compare and use all, but I think my Guerlain mascara won't last until July. When I use my Guerlain Mascara, I don't need to use too much make-up around the eye area. I have learned that when paired with my trusted white eyeliner, my peepers are all perfect and pretty already! :) Try it! Last but not the least, now that it's quite cold, I hope you don't take your lips for granted. On a normal day, I love using Kiss Kiss 242 Lip Balm by Guerlain. The packaging (Gold) makes it look like a lipstick but really it's moisture-locking effect on the lips is divine. Plus the juicy color it leaves is quite delicious! To those who would like to go glam especially at night, do try Guerlain's Brun Jazzy lipstick. It is a deep dark mysterious red that can only mean one thing: business. To those who are not familiar with Guerlain, they're available at Rustans Shangri-la and Rustans Makati. Make sure you visit them and try their wide range of perfumeries too! They've got lots of for men products as well so if you're looking for the perfect Father's day gift, they might have what you need in store.